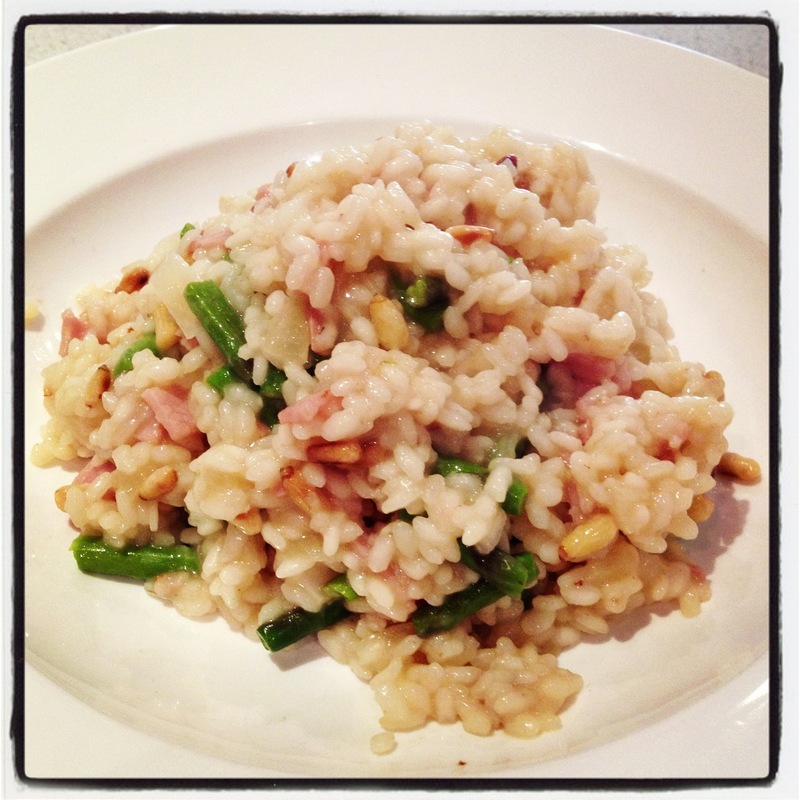 Asparagus, Bacon and Pinenut Risotto | sweet ravioli! Here is a savoury dish – a nice change after the last few cake recipes I’ve posted! Risotto makes a great weeknight meal that is healthy and filling and the best thing about it is that you can add almost any vegetable, any protein, any flavour base to make it interesting. I am loving spring vegetables, especially asparagus, so I popped some into this risotto. I wish my children liked it, but they pushed it to the side of their plates, along with the pinenuts. Actually, little man, who is now four years old, protested vehemently over the pinenuts. Note to self – leave them out next time, it is not worth the hassle! Heat the stock in a medium saucepan. In a larger, heavy based saucepan, over medium heat, add the oil and butter, and when the butter has melted, add the onion and garlic. You may need to put the heat down at this point – you want to cook the onion and garlic slowly until the onion is translucent. Add the rice and stir it around until it also becomes translucent, about a minute or so. Add your cup of wine and keep stirring until the alcohol burns off. Then add your first ladle of stock and your asparagus. Its important to keep the heat down low so as not to cook the outside of the rice too fast and be left with uncooked rice in the middle. Continue stirring your risotto, adding a ladle full of stock at a time until the risotto becomes creamy and you’re out of stock. Add some salt and check the texture of the rice. If its al dente, stir in the pinenuts and then take it off the heat. Stir in the extra butter and the parmesan, some salt and pepper if needed, and then pop the lid on the saucepan. Leave it to rest for two minutes before serving. Best eaten asap!